Last night, I went to see “Spectre”, the new Bond movie, in the O2 centre on Finchley Road. A review of it, in the New Yorker, is here. Being careful not to do any ‘spoilers’, towards the end of a rather long but excellent film, there is a futuristic scene involving James Bond. The Bond baddie of this movie mentions ‘the fusiform gyrus’, which is indeed an interesting part of the brain. Fans of cognitive neurology will of course recognise this part of the brain at once. 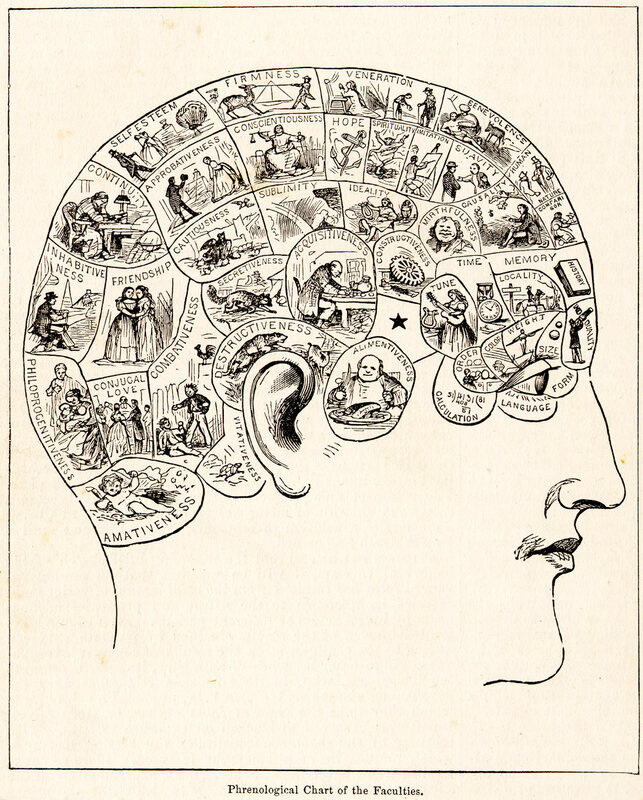 The temporal lobe, part of the brain near the ear, has a number of different functions including learning and memory. That’s why when, early on in the disease process of Alzheimer’s disease affecting the ‘hippocampus’ in the temporal lobe, persons often remark losing memory of whole recent events. Elsewhere in the temporal lobe is a distinct perceptual function – in particular for the higher order complex processing of objects. It’s been known for over thirty years now that there are neurones in the ‘superior temporal sulcus’ which appear particularly sensitive to faces. One of the classic reports in the literature is here. The superior temporal sulcus and fusiform gyrus are both parts of the human brain which are intimately connected in both structure and function. The question for future research will be to find out why and how. The idea that a part of the brain has a particular function has been around for some time ago. Phrenology (from Greek φρήν (phrēn), meaning “mind”, and λόγος (logos), meaning “knowledge”) is a pseudoscience which was primarily focused on measurements of the human skull, based on the concept that the brain is the organ of the mind, and that certain brain areas have localised, specific functions or modules (source). All this came to a fore in a classic from the MIT Press from Jerry Fodor, “The Modularity of Mind” (1983). It is of course a hugely powerful issue whether one part of the brain holds the key to a particular function. But it’s been latterly been realised that localised parts of the brain ‘doing function’ identified in a simplistic way, say the Wernicke area for language comprehension, may in fact be a rather complicated discrete distributed neural network. An example of a recent paper from the cognitive neurology literature is here. This was indeed a hot enough question for the great Oliver Sacks to devote a piece of work to, entitled “The man who mistook his wife for a hat”. That face perception in humans was truly recognised in Bodamer’s 1947 classic paper on prosopagnosia. Problems in perception of face identity and facial expression can occur in isolation. Though there are methodological concerns, it could be that certain persons living with Huntington’s disease could have a real problem, for example, with the perception of disgust. Dementia, the umbrella term usually given for chronic progressive diseases of brain, can affect any function – it’s not just about memory. Therefore unsurprisingly persons with dementia might theoretically have problems with face perception. 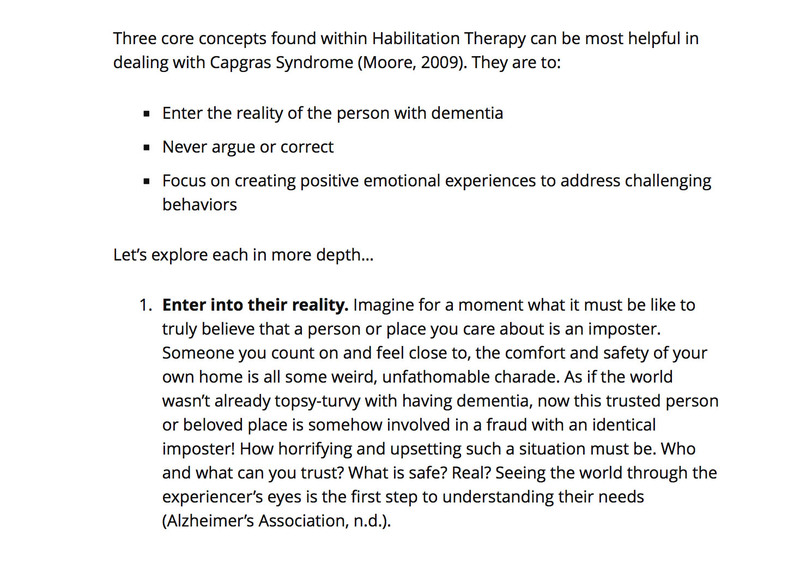 One intriguing example is the “Capgras delusion“. The Capgras delusion (or Capgras syndrome) describes where a person holds a delusion that a friend, spouse, parent, or other close family member (or pet) has been replaced by an identical-looking impostor. There are various approaches which can be tried here perhaps. One which is interesting is “entering the reality”, as described here. This is part of the ethical debate about ‘therapeutic lying’ which was introduced last week in an excellent plenary session by Toby Williamson at the UK Dementia Congress 2015 in Telford. Of course, entering the reality of James Bond is an altogether different matter.